This past fall, the Humanities Institute invited Saint Anselm students, faculty and staff to open their minds, and their lunches, for the “Come Friday” forums. The forums will return next semester for those hungry for more. The next 12 discussions will return on Jan. 18, starting with one themed for Martin Luther King Day, “Is the Civil Rights Movement in America over?” facilitated by Chris Bruell of the Criminal Justice Department. There are also themed discussions for Valentine’s Day, “Is there really such a thing as true love?” and President’s Day, “Who were the best and worst U.S. presidents?” facilitated by Kyle Hubbard of the Philosophy Department and Andrew Moore of the History Department. 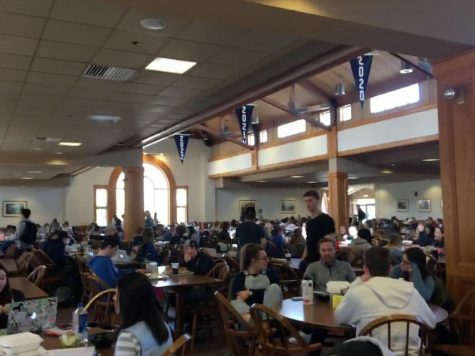 In addition to helping set up for the Friday forums, Beaudry also writes for the Humanities blog, “Wednesday’s Wisdom.” The blog was inspired by Leo Tolstoy’s, “A Calendar of Wisdom,” and is a place where people in the Saint Anselm community can add their daily reflections to the calendar each week. For more information about the Humanities Institute or the “Come Friday” forums, contact Dr. Gary Bouchard at [email protected], or check out the Humanities blog at humanitiesblog.anselm.edu. The spring 2019 “Come Friday” schedule is now available at the institute’s website, at https://www.anselm.edu/gregory-j-grappone-humanities-institute/come-friday-forum.